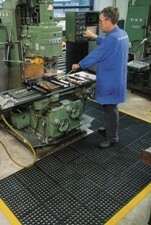 Having an anti-fatigue mat on your work area can make a difference because less body aches means more production. 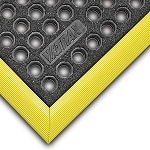 The 550 Cushion-Ease Floor Mat is made of a highly durable rubber material designed to be chemicals, oils, and grease resistant while also providing extra cushioning for decreased muscle and back pains. Large holes are cut out to create a drainage system ideal for removing liquids and debris from work areas for a safer environment. 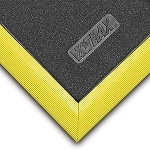 This safety mat allows for easy joining of multiple floor padding of this same model and is fully compatible with NoTrax M.D. Ramp System for on-site custom configurations. Cleaning this floor padding can be accomplished with a hose and some mild degreaser for a brand new look all over again. 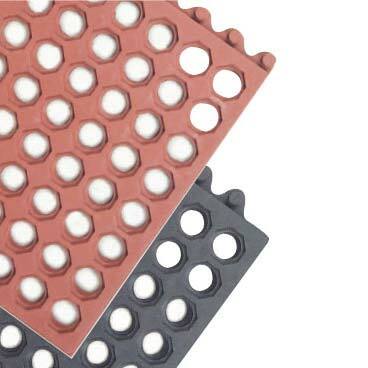 This floor covering is available in two different dimensions to meet all your customization needs.